In Industrial Institute of Agriculture Engineering (Poznań, Poland), together with the Institute of Vehicle of Warsaw Technical University and firm Promar Poznań action have been taken to design autonomous field robot for sowing and cultivation of crops. Designed robot is to be autonomous device. It will automatically perform the sowing, weeding and selective spraying plant crops such as sugar beet or maize. The robot will work in various terrain and weather conditions. It will move on the dirt roads and on cultivated fields, and therefore it will have to overcome mud, sand, puddles and avoid obstacles such as ruts, bumps in the road and stones. The achievement of this objective required the development of a suitable chassis, system of autonomous control in terms of driving and realization of agronomic processes. The aim of the study was to evaluate the horizontal and vertical force of reversible moldboard plow at various operation depth and speed. A complete randomized block design was used with three replications, the first treatment was tillage depth with three levels 15, 20 25 cm and the second treatment was the forward speed with two levels 3.9, 6.3 km·h-1. The result showed that both forces were increased as increased of tillage depth and speed, however, the operation depth was more effective than speed, on the other hand, the horizontal force was more affected than vertical force by increasing both of depth and speed. 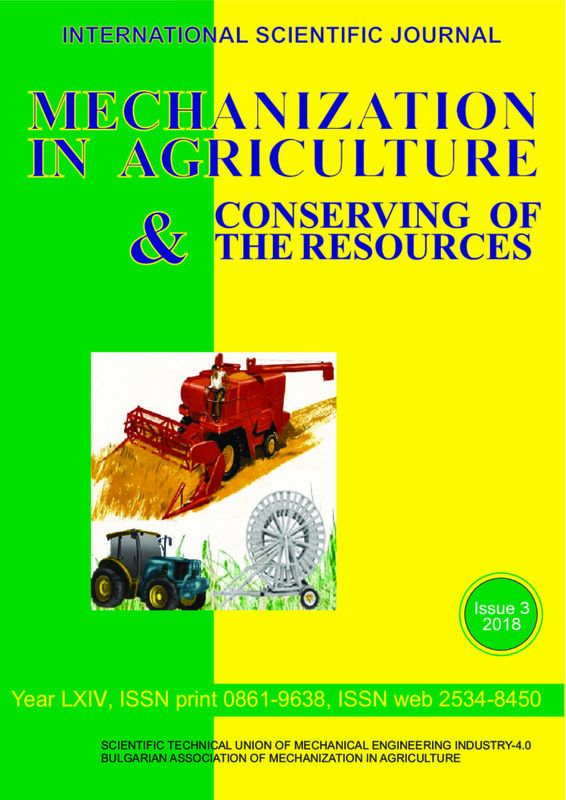 Here is presented the influence of pedagogical technology of the through study of agricultural machines on the formation of readiness for the future activities of future specialists in agroengineering. Here are analyzed the dynamics of development of professional competences from the first year of study, during the study of the discipline «Introduction to the specialty», and further on, educational practice, constructive and theoretical courses of agricultural machines, course design, industrial practices, etc. Here are given the examples of a set of basic text-based tasks in the discipline “Agricultural Machines”, which deal with soil cultivation, the work of a cutting machine, a reel, a system for cleaning a combine harvester, etc. The factors emphasizing the quality of preparation of agroengineering specialists, development of the ability to perform design functions are highlighted. The issue of diagnostics and criteria of general amount of knowledge about the agricultural machines at the final stage of training is covered. Cover crops (green manure) brings not only immediate advantages like slowing erosion, suppressing weed growth, improving soil structure, increasing nutrients and water content and hindering some pests but also long term ones like decreasing erоsion, air pollution, investment in mineral fertilizers and herbicides and increasing microbiological activity. The paper gives examples of good practices both for whole and row-crop grains. It also suggest a useful crop rotation for a period of five years. It shows the urgency of the task of creating a methodological and program base that supports the adoption of pre-project solutions in the placement and justification of the parameters of prospective small hydro power plants in Kazakhstan. The questions of application of the data of geoinformation systems using SRTM DEM and ASTER GDEM in the making of a digital relief model are considered. Moreover, showed the using this application for preparation of the feasibility study for the construction of small hydro power stations. A brief overview of the used geoinformation systems tools is given. The deviation of proposed methods for making topographic maps was studied using the example of calculating the volume of the reservoir on the Baskan river in the Almaty region. The evapotranspiration of Gergana long-fruit cucumbers was established in four years of field experimentation with drip irrigation, grown in greenhouse conditions on chromic luvisol soil in the Sofia region. Different irrigation regimes have been tested – from full satisfaction of the daily needs of the culture from water to irrigation with 20% and 40% reduced water application rates. The total evapotranspiration values for the study period were determined. For the needs of practice and design, the ten-day values of the biophysical coefficient Z are calculated, which depends on the biological characteristics of the crop and the weather factors. On the basis of the established relationship between evapotranspiration and evaporation, the values of the coefficient of crop in unheated plastic greenhouses are calculated as the average for the cucumber vegetation curve Ki = 1.46.